ION TOOL Hog Ring Pliers and 150 galvanized hog rings. 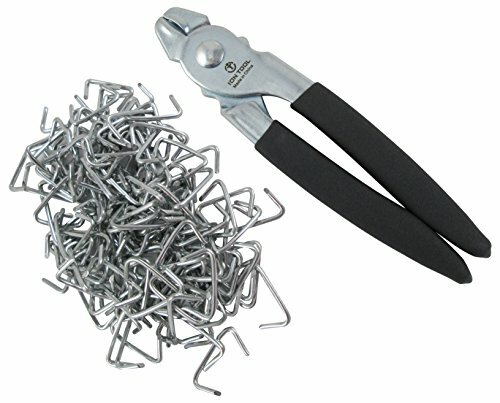 Easy to use spring loaded steel hog ring pliers with cushioned non-slip grips. Designed to hold and close individual hog rings up to ¾" size. Designed for us in upholstery, bungee or shock cords, netting, cages, bagging, traps, sausage casing and meat bags, and fencing. This kit includes approximately 150 galvanized 3/4" hog rings, enough for one seat. Galvanized rings will help prevent against rusting. If you have any questions about this product by Ion Tool, contact us by completing and submitting the form below. If you are looking for a specif part number, please include it with your message.